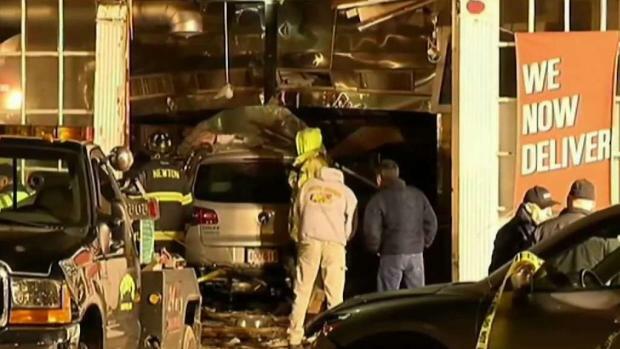 A man who drove into a Massachusetts pizza shop, killing two people and injuring seven others, will be sentenced on Tuesday after he was found guilty on all charges last month. A man who drove into a Massachusetts pizza shop, killing two people and injuring seven others, faced a judge on Tuesday during an emotional sentencing after he was found guilty on all charges last month. Brad Casler, 56, was sentenced to four years in prison after he was found guilty on two counts of motor vehicle homicide and one count of negligent operation in connection with the fatal March 2016 crash at a Sweet Tomatoes restaurant in Newton. His sentencing came after he rejected a plea deal that would have given him two years in prison. His attorney asked that his client be released on bail pending an appeal, but that request was denied. Eleanor Miele, 57, and Gregory Morin, 32, were killed when Casler's car plowed into the eatery. 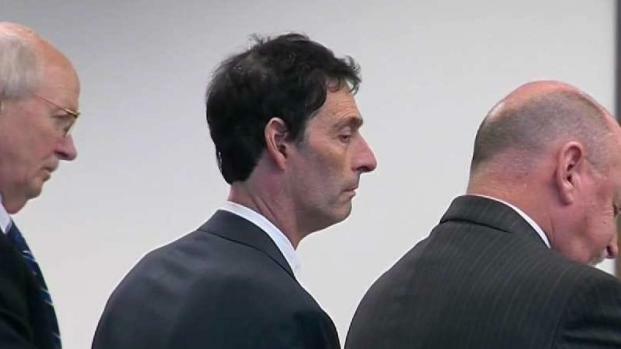 Brad Casler, the man accused of driving into a Massachusetts pizza shop, killing two people and injuring seven others, was found guilty on all charges Monday. "On March 1, 2016, I lost my husband, my partner and my best friend," said Morin's wife, Erica Miller, during victim impact statements Tuesday. "Joy was taken from our lives that day. I think about Greg every day, and though the grief is not as raw as it once was, it will always be there." "There's no good here," she added. "Nothing will bring Greg back. Nothing will replace the void that we feel. But there should always be consequences for our actions." "Eleanor's death was preventable and avoidable," Miele's brother, Thomas Desmond, said on Tuesday. "Our family has been left with a sense of betrayal, a feeling of being robbed. We are torn between grief and anger." Shortly after noon, in an unusual move for a sentencing hearing, Casler himself addressed the court, tearfully apologizing for his actions. "This is difficult for me, but it's time" he said. "I live with it every second, every day." Casler said he was never told not to drive, and would never have put anyone in harm's way if he had known something like this might happen. 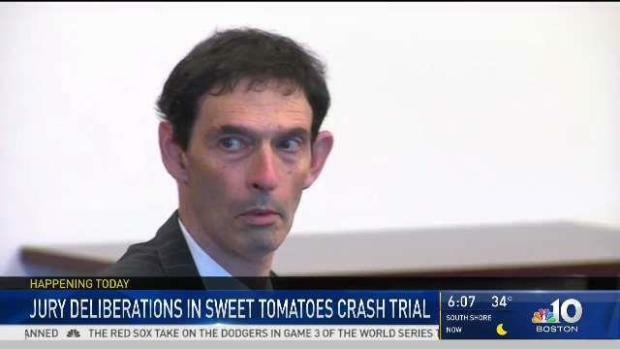 Jury deliberations continued Friday in the trial of Brad Casler, the man accused in the deadly car crash into the Sweet Tomatoes restaurant in Newton, Massachusetts, more than two years ago. "My emotional scars will never leave," he said. "I think about this every second I am breathing." Friends and family of Casler's also spoke in court Tuesday, attesting to his character and his remorse at causing the crash. Casler was found guilty on Oct. 29 after two days of deliberations. He faces up to seven years behind bars. He was ordered to be held without bail through his sentencing. His attorney argued during the trial that his client's multiple sclerosis was to blame for the crash, but prosecutors questioned why he was even behind the wheel in the first place. "His cognitive deficiencies caused him to lose control of that vehicle," said Tom Giblin, Casler's lawyer. Casler testified about how multiple sclerosis regularly affects him with dizziness, tingling, cognitive issues and "brain fog." He was diagnosed in 1996 and calls the disease "unpredictable." Jury deliberations resume for the trial of Brad Casler, who was charged for a fatal motor vehicle crash in March 2016. Prosecutors accused Casler of panicking after he was driving too fast. They said he told first responders at the scene that he didn't have an episode related to his multiple sclerosis. "Eleanor Miele, Gregory Morin all suffered the consequences of the defendant's choice to drive a car," Assistant District Attorney Chris Tarrant said. "It wasn't multiple sclerosis. It was Brad Casler." Earlier in the trial, Meriam Saim, an EMT who treated Casler, testified he told her that he didn't believe that his multiple sclerosis played a role in the crash. "I asked if he thought that the multiple sclerosis may have played a role in the accident if he believed that he had a flare of sorts," said Saim. "He said, 'No.'"